Another transpacific journey, and it seems the airline has discontinued serving complimentary alcoholic beverages. I swear the passenger across an empty seat at the aisle was on the same flight last fall. A pro, she had cocooned herself in the provided blanket, ordered a beer, and watched films on the small monitor installed in the back of the seat in front of her. I followed suit, as daytime drinking shifted to a permanent midnight of the sky. The only signal she was awake was the dull light from her LCD screen or hands atop the folding tray table holding a small book with removable cover. Could it be the same pale cloth cover now? The same woman on an annual journey corresponding to my own loose festival commitments? 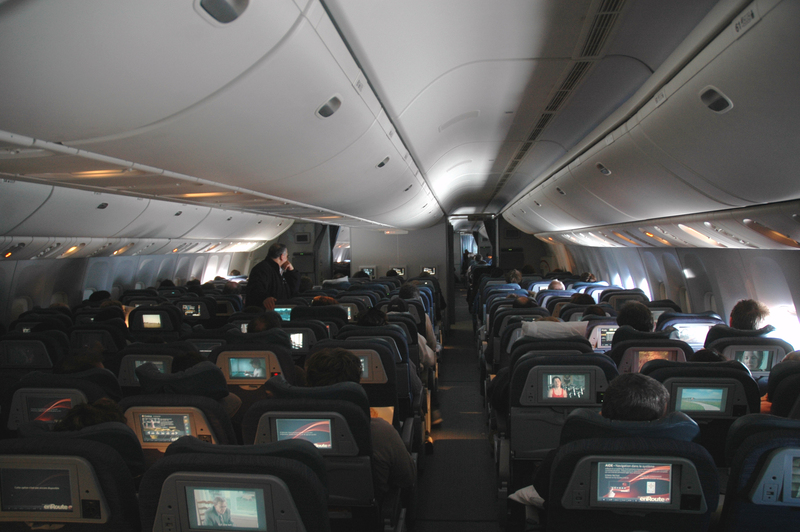 There is a good selection of films on the flight, which are free and in unlimited supply—as long as you can stay awake. One title each year seems to be screening at the contemporary film festival I am now departing. Again, I watch five features consecutively. This time, I drink a hot green tea poured from the flight attendants’ dubious plastic thermos in the aisle. Despite the expense, the woman shells out for a beer can same as last year, and we settle in for the long flight along with other passengers. Drinking. Sleeping. Watching. Photo: Tom Mascardo, in-flight map (CC BY-ND 2.0). Header photo: Caribb, back cabin [CC BY-NC-ND 2.0]. I used to make a point of looking out the window during every takeoff and landing; however, I’ve begun simply closing my eyes. I run the numbers in those weightless moments of takeoff and heavy instants of landing—how many flights I’ve been on, and the grandfather I never knew. That plane clipping a bridge before crashing into a river. One senses a shift, like Daney, when he wrote that “what we call the history of cinema is the history of the public’s domestication, its immobilization. Broadly speaking: immobile people who became sensitive to the mobility of the world, to all types of mobility, the mobility of fictions (ahead to happier tomorrows and various other dreams), bodily mobility (dance, action), material and mental movements (dialectical and logical games).”2 These are the oft-misunderstood shifts in spectatorship from the time of early film, in which the debut of cinema struck viewers less like a moving train than already riding one that had suddenly met a high-speed turnout. Audiences had become accustomed to watching moving images in darkened spaces while stationary for some time, although cinematic grammar and practices of expression, communication, and expectation were yet to be developed. While the representational capacities of movement and animation were expanded by photochemical film as compared to earlier magic lantern shows and other optical illusions, intellectual experiments in editing and animation further pushed the mobility of the image, centered around a stationary modern viewer. Far-flung Lumière operators also captured footage internationally and relocated it for local spectators, harkening new forms of image mobility as well as echoing colonial expansion and appropriation. Photo: Andrew Scott, upper monitors (CC BY-NC-SA 2.0). To be clear, the invocation of the immobile image does not refer simply to the still image of the photograph or freeze frame in film (but also sometimes that). More so, here is an attention to the formal qualities of the moving image frame and its temporal relations in tributary histories of cinema, television, advertising, and other forms of audiovisual communication, with a focus not only on the shifting sociality of the spaces in which those images are watched or happened upon, but the possibilities rendered in those encounters, and the interventions afforded to those thinking strategically with images. As Daney notes, when in Godard and Miéville’s Here and Elsewhere (1976) a line of people appear one by one and hold up still photographs, it is before a stationary videocamera, rehearsing the animating mechanics of cinema. But now, as is widely noted, many travel with not only the capacity to produce moving images in their pockets, but cameras to record them as well. And with such mobile phones—communication devices no less—we do so often reproduce our own images and surroundings, broadcasting them to small and large audiences. However on this flight, we’re each watching images next to one another. 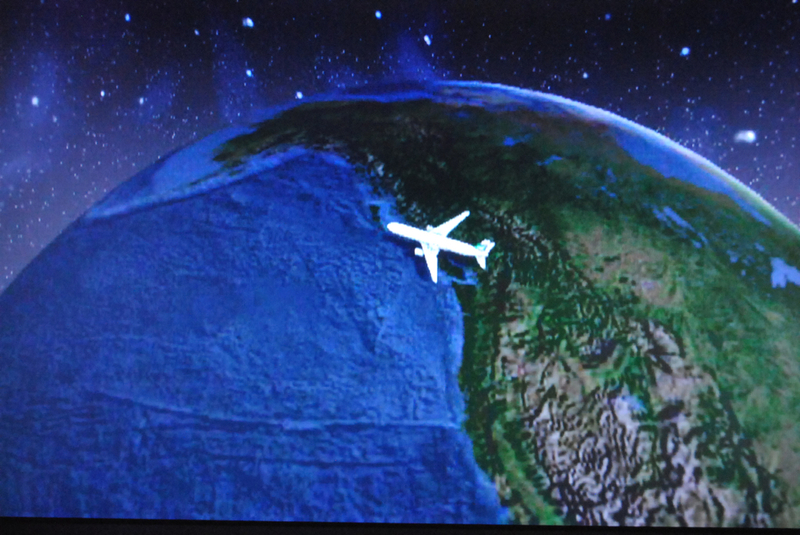 They are on different screens, playing back different programming (feature films, flight progress maps, audio-only music channels, recent television news broadcasts, sitcom episodes) with separate dubbing and subtitle track options, yet here we are still for just a moment, in motion together on a common flight pattern. The screens freeze as pilots’ and flight attendants’ announcements are piped into passengers’ provided earbuds. Lights dim theatrically for the destination’s time zone, and one sees fragments of different programs on the backs of nearby headrests—recognized or not. The films on the plane (a market distinct from theatrical, packaged home entertainment, streaming, and VOD) aren’t particularly memorable: a Roman bath architect time-slips to the present; an old man travels across states to claim a sweepstakes prize; a family copes with the mother’s illness; a cowardly war profiteer is thrust into combat with the curse of invincibility; a drug lord purports to collaborate with police investigators. However, this moment of shared visual entrancement amidst the déjà vu of recognizing an annual flight companion stands as one of my most affecting cinematic moments of 2014. Launching from a hub of film exhibition and industrial networking into high velocity airborne spectatorship, questions of personal and communal vision were dramatically emphasized in this moment. 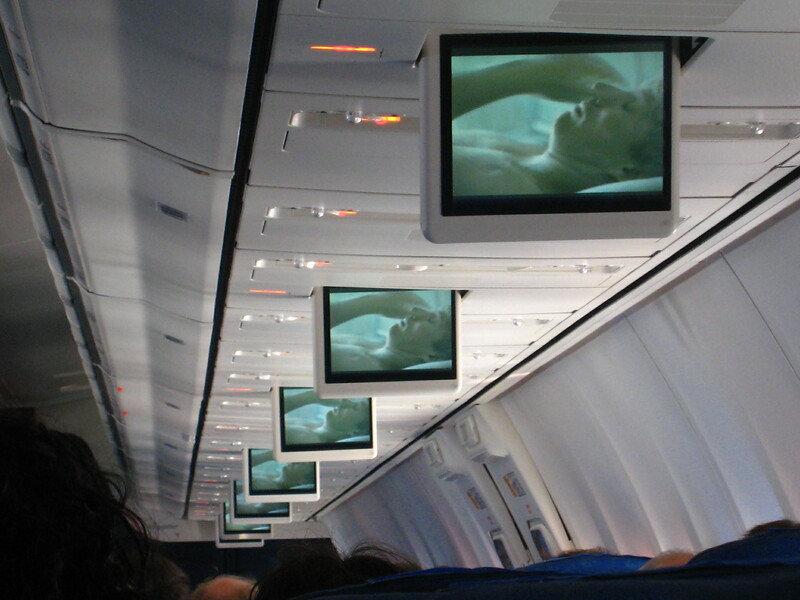 Shifting Daney’s paradigm, the in-flight viewing experience invites a captive viewer to the presentation of immobile images. Burning off jet fuel in the sky together, we watch individually-curated streams of commercial audiovisual material, and the terms of spectatorship as we’ve normally understood them shift—or is it that their current character is only intensified? From the seats of this aircraft there’s a window into something else here, posing questions which extend from industrial content programming and interface design to user programming and political imperatives of a collective body’s shared destination. A second moment, months earlier on the 7 train that past summer: it’s in the days following the murder of Michael Brown on a suburban street in Ferguson, Missouri, and a month after Eric Garner was choked to death outside his Staten Island business. We’re just above ground and departing Queensborough, and as cell phone service resumes I encounter a news report in my social media streams. Perhaps because video evidence in the Ferguson case was absent, leaving facts to obfuscation and the victim’s character to subsequent assassinations, I quickly clicked on two embedded videos declared to document the killing of another young Black person at the hands of police mere miles from the site of Brown’s death. Sitting on the train that night, among many others in rapt attention to their respective phones, I watched several silent convenience store surveillance video camera feeds cut together to track the progress of a man, Kajieme Powell, as he walked in and removed two canned beverages, and walked out. After nearly a minute, he returns inside, picks up a packaged snack, and walks out. 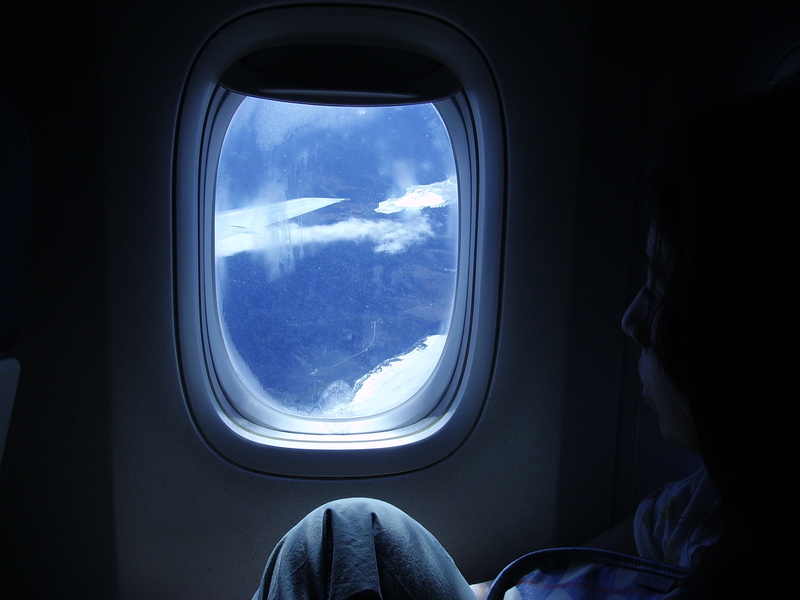 Photo: JNA, cabin window (CC BY-NC-SA 2.0). Of all the visual representations of death, this surveillance video and cell phone camera record from St. Louis watched on a train in Queens left me the most shaken. In watching both still and moving image records, we may look for a crystallization of history in a moment that can spread outwards toward political action. My thought (and to state it, I’m trying to see if it holds up) is that these moments on planes and trains suggest a similar immobility in public life, one linked to a curious parity in our own movement and that of the image. Still for just a moment, along a flight path or subway tracks, a spectatorship attuned to the images of small screens displaying big budget spectacles as well as camera phone pranks and tragedies highlights a crisis of proximity between the viewer and its image, in which demands for rigorous engagement with images and the social realm are newly distinct and entwined.